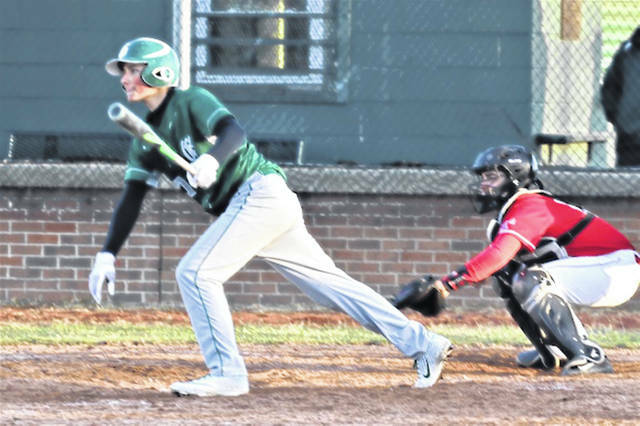 GREENVILLE – The Greenville boys varsity baseball team grabbed victory in dramatic walk-off fashion, taking advantage of freshman Warren Harztzell’s walk-off single in the bottom of the seventh to defeat the visiting Troy Trojans. Trailing 3-2 with bases empty and two outs in the Wave’s final at bat, Greenville senior catcher Ethan Saylor took first by way of a hit batsman followed by a Tyler Beyke liner to center putting runners on first and second. With Hartzell stepping to the plate, the Greenville freshman was looking at a 1-1 count when Saylor used a heads-up play to slide safely into third by way of a Troy wild pitch. Beyke followed with a steal of second putting both runners in scoring position for the Wave. Facing a 2-ball, 2-strike pitch, Hartzell settle back in the box to drill a liner to left plating the speedy duo of Sayler and Beyke giving Greenville a walk-off GWOC win over the always tough Troy Trojans baseball team. Troy got on the board with three runs in the top of the fourth, a 3-0 lead that would hold up until Greenville would score two in the top of the sixth with Beyke using a hit batsman to reach first. Terry Miller followed with a single to right moving Beyke to third with Coach Blumenstock inserting a speedy Connor Mills to run for Miller. Reed Hanes plated Beyke with a single to center for a 3-1 score while moving Mills to third. Kole Francis stepped to the plate following a Trojans pitching change and grounded into a fielder’s choice scoring Mills with the Wave closing to 3-2 after six complete. The Trojans loaded the bases in the top of the seventh with a single and two walks only to have Francis cleanly field a grounder to short and toss to Mills at second for the third out keeping Troy off seventh inning board and set up the Wave’s dramatic comeback win. Alex Kolb opened for Greenville on the mound tossing 4.2 innings giving up 3-hits, 3-walks, 6-strikeouts while giving up 3-earned runs with senior Ethan Saylor behind the plate. Titan Grote pitched 1.1 innings in middle relief allowing 1-hit, striking out six and allowing no runs. Beyke pitched the final inning giving up 1-hit, 2-walks, 1-strikeout and no runs to pick up the win for the Wave. Beyke paced Greenville at the plate going 2-3 with 2-runs scored. Hartzel was 1-4 with 2-RBIs, Hanes went 1-2 with a walk and a RBI, Francis accounted for a RBI, Saylor a run and Miller and Ethan Flannery each collecting singles. Greenville outhit Troy 6-5. The Trojans played error free ball while the Wave played impressive defense allowing a single error on the night.